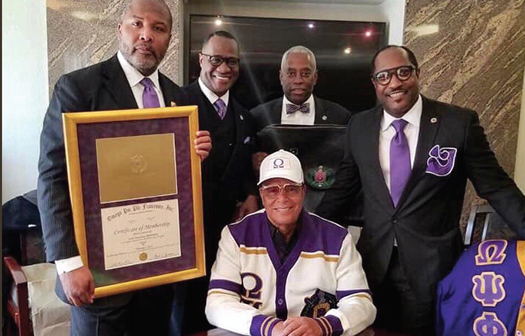 The Feb. 2 post included photos with officials of Omega Psi Phi and Muslims Don Enoch Muhammad, an aide to the Minister and Tony Muhammad, the Western Regional student minister for the Nation of Islam. Both are members of Omega Psi Phi. He eventually left college to marry the love of his life, Mother Khadijah Farrakhan, and both joined the Nation of Islam. He was eventually named National Representative of the Hon. Elijah Muhammad and with the departure of his teacher in 1975, the Minister started to rebuild the Nation around 1977. According to Don Enoch Muhammad, the Minister was inducted as a full lifetime member of the fraternity. Twenty brothers of the Nation of Islam who are members of Omega Psi Phi gladly paid for the lifetime membership dues and fees for Min. Farrakhan. “Uprightness is one of the founding principles. Can you stand to walk with a man that strives to walk upright?” he asked. In 2011, the Minister received a Lifetime Achievement Award from the Chicago area metropolitan chapters of Omega Psi Phi. That night the Minister said the men of Omega Psi Phi should not be sending their children off to college only to come out begging for jobs from someone else, when the men of the fraternity could create jobs and industry with the knowledge and connections they have gained during the 100-year history of the organization. Omega Psi Phi Fraternity was founded in 1911 at Howard University in Washington, D.C. by three students. Today, Omega Psi Phi has over 700 chapters throughout the United States, Bermuda, Bahamas, Korea, Japan, Liberia, Germany, and Kuwait. There are many notable Omega men recognized as leaders in the arts, athletics, business, civil rights, education, government, and science at the local, national and international level. Congratulations to Min. Farrakhan and the brothers of Omega Psi Phi!